1957 ਵਿੱਟ, ਗੋਲਡਵਿਨ ਨੂੰ ਉਸਦੇ ਮਾਨਵ-ਹਿੱਤ ਕੰਮਾਂ ਲਈ ਜੀਨ ਹਰਸ਼ੋਲਟ ਹਿਊਮੈਨੀਟੇਰੀਅਨ ਅਵਾਰਡ ਨਾਲ ਸਨਮਾਨਿਤ ਕੀਤਾ ਗਿਆ ਸੀ।. ↑ Obituary Variety, February 6, 1974, p. 63. ↑ Jang, Meena (January 31, 2015). 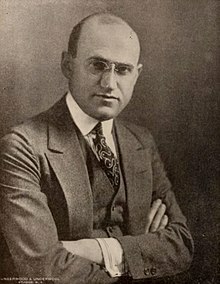 "Samuel Goldwyn: Remembering the Movie Mogul on the Anniversary of His Death". The Hollywood Reporter. Retrieved August 8, 2015. ↑ The sz-spelling is a not-uncommon Polish transliteration for the Yiddish sh-sound, which only requires a single letter in that language. ↑ Public Papers of the Presidents of the United States, Richard Nixon, 1971. 1971. p. 490. ISBN 0160588634. Retrieved 2013-04-01. ↑ "Samuel Goldwyn | Hollywood Walk of Fame". www.walkoffame.com. Retrieved 2016-06-28. ↑ "Samuel Goldwyn". latimes.com. Retrieved 2016-06-28.